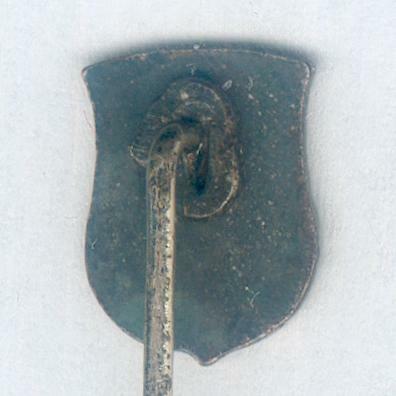 Gilt metal and black and white enamel escutcheon mounted on a stickpin; the face gyronny of eight, argent and sable, a cross flory or and sable imposed centrally; the reverse plain; some wear and age discolouration; overall height 47.17mm (1.86 inch), escutcheon height 10.8mm (0.42 inch). The Order, founded to defend the interests of the Vatican by the Comte de Beaumont in 1870 after the incorporation of Rome into a united Italy, was taken over by one Domenico Piccoli in the 1880s. 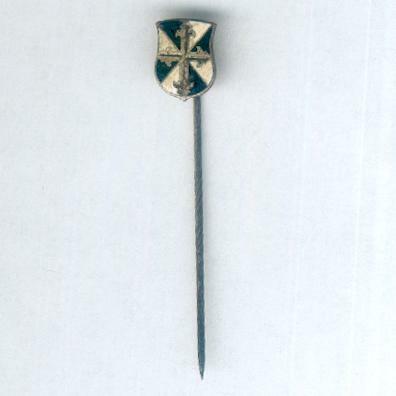 It was at this time that the current form of the cross of the order emerged and its members began to style themselves ‘knights’. Relations between Church and the association cooled rapidly and in 1904, the Vatican’s Secretary of State wrote to Piccoli, informing him that the Order of the Militia of Christ was not approved by the Holy See. Piccoli died in 1916, but the association seems to have survived, at least into the 1970s.